How often do you look at your bathroom and wish it had a bit more personality? Have you been looking for a way to get everything looking a little bit more inventive and personal? Many people just stick to the same theme and design in the bathroom and this can leave you with a bland and tasteless room. The best solution to this is to pick up a highly durable yet colourful toilet seat. 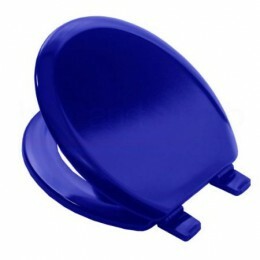 Our marine blue toilet seat offers the perfect way to try and re-invigorate your rest room so that you can have the full picture in front of you. Being able to give your guests something a bit brighter to park themselves down on is never a bad thing – so why brighten things up to your usual standards with this excellent wooden toilet seat?